Can't believe that the "hump day" of RISE Conference has wow-ed and is over! The Financial and Tech intensive talks today proved very thought-provoking, and the scanned connections page is becoming quite the scroll. Want to know more about the startups in Hong Kong, how to give a good pitch, as well as where to eat, sight-see and have a good time here? Download the special HK VIBES MAGAZINE by WHub! Of course, as usual, WHub is here to tell you the must-see events in chronological order so you don't miss anything out on the very last day! Keep checking the WHub Blog to see key takeaways of the day, and not to miss events for the next day. 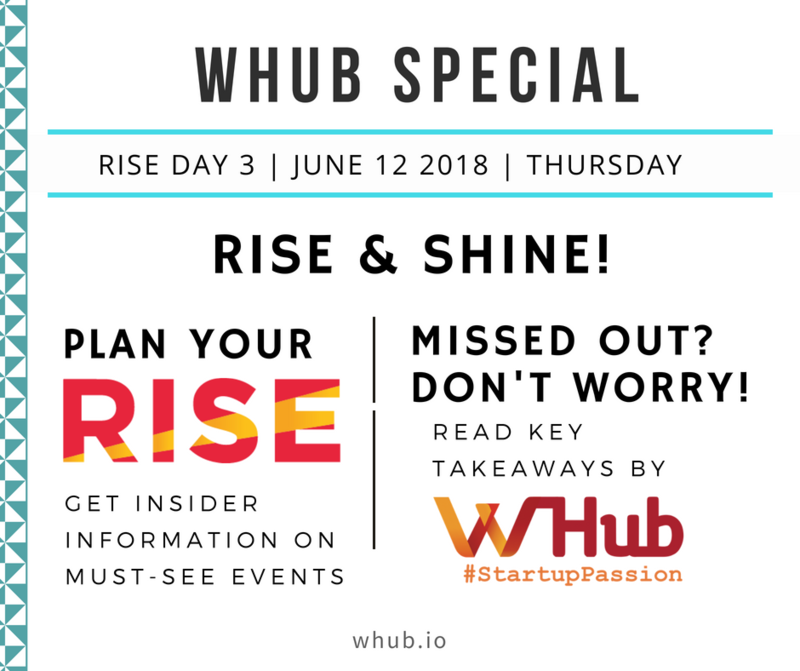 Also, look through the WHub RISE 2018 Calendar to lock in some amazing Evening Satellite Events. Come listen to the CEO of Cheetah Mobile, Fu Sheng that will explore what are the new opportunities in the robotic world and how humans can cooperate with them. Monster Strike being the world’s biggest mobile game, Kosuke Taru, director of Mixi will discuss what will be the next Monster Strike will be and what is the future of the mobile gaming industry! The best modern cook Marco Pierre White, Commercial Officer of Cathay Pacific, Paul Loo and Wei Du from Channel News Asia will explain the balance between how to be a leader as well as being strategic. Going from being a gaming company to one of the world’s most important investment holding groups, we all wonder what is the future of Tencent and its investment strategy for 2018. Dan Brody will be exploring how Tencent will be growing and present in the future. Brad Smith lays out facts about technology. In Beijing, Microsoft has 3000 engineers who have been setting records as they are now creating computers that are thinking with the capacity of humans. "We've reached a 96% accuracy rate of computers being able to recognize things in photos, which is the equivalent of the ability of a college graduate". Brad Smith believes with the progress of technology, we could cure cancer in a couple of decades. However, we have to be ethical with the way we develop AI. We need to recognize that we are going to need a new type of conversation about ethics and philosophy when it comes to AI: a global understanding. Ultimately our challenge is clear: develop these ethical principles and work towards creating a new generation of laws. He also explains that we should be using this technology to help some of the world's most pressing problems, which AI has the potential in achieving. The suggestions he provided were using AI to help conserve the Earth, as well as AI to help those with disabilities, and mentioned how Microsoft's Seeing App has improved the lives of 1 billion living with a disability. Whilst praising the dedication and motivation of his staff members, Sean Rad advised that you should really love what you do, because when things get hard, it's easy to lose sense of why you're doing it. It is important to inspire others to love doing it as well. Rad has founded 3 startups with various levels of success but he proclaims that mistakes "excite" him as they present him with the opportunity to learn and grow. His advice to any startup that is planning on scaling from Day 1 because news nowadays travel instantaneously and people will be disappointed about hearing a product they can't use. He also stresses that we should understand the differences in culture - it isn't enough to just localize the app in different languages, because countries have their own social interaction patterns and cultures - it's important to get to know the variations when developing as a whole. As Rad has now move along to become an investor, and has allocated resources to 35 startups, he explains that he is very interested in technology, AI in particular. He believes that AI can create new experiences that would help us connect better in the real world, thus bringing us closer together. Regarding how he came up with the swiping mechanism, he references tradition database online dating applications - it was still intimidating to initate conversation because there's always the fear of rejection. The idea he came up with was the "Blind double option", which entails that one will not know if they have been liked until they liked the person. This simple and powerful concept he claims "revolutionized" dating apps. Remember to check for tomorrow's must-see events so you don't get a serious case of #FOMO!